Another one of her charotisms! 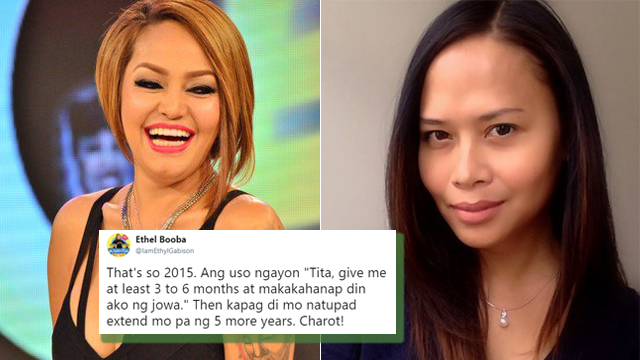 (SPOT.ph) TV personality and comedian Ethel Booba is known for posting some of the most #woke statements on Twitter—at least among Pinoy celebs. She also never forgets to add a dash of humor and a bit of sarcasm, making her burns all the more painful for the person on the opposite end of a 140-word tweet. 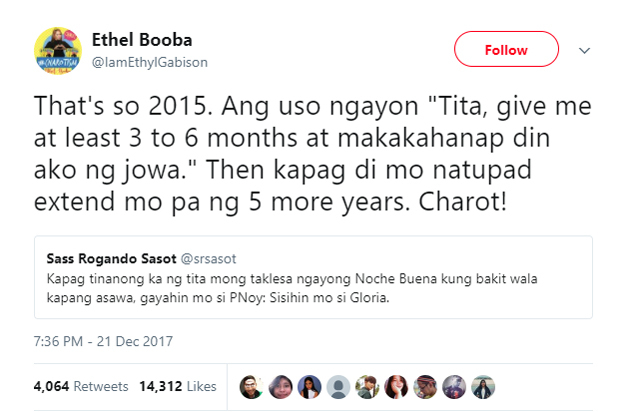 This Christmas, it was a tweet by Sass Sasot—who happens to be one of the Duterte administration's most vocal supporters—that prompted her best comeback ever. President Rodrigo Duterte vowed to the Filipino people during the campaign period that he would eliminate the illegal drug trade in three to six months. "If elected president, give me about three to six months, I will get rid of corruption, drugs and criminality," he said in February 2016 to the students of the Mariano Marcos State University in Batac. A few months after he was elected into office, the president said in a press conference in September: "Just give me [a] little extension of maybe another six months. 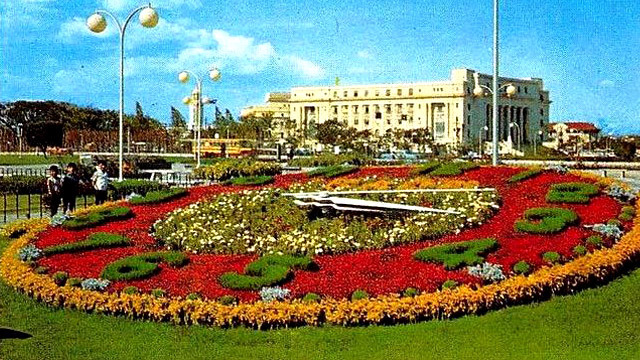 I did not have any idea that there were hundreds of thousands already in the drug business." Booba also referenced a popular Duterte line in another tweet. In July 2017, the president told his audience during the 26th anniversary of the Bureau of Jail Management and Penology at Camp Aguinaldo: "E ako lang harap-harap mag-utos, 'Patayin mo 'yang p**'yan.' Sino pa bang iba, beh? 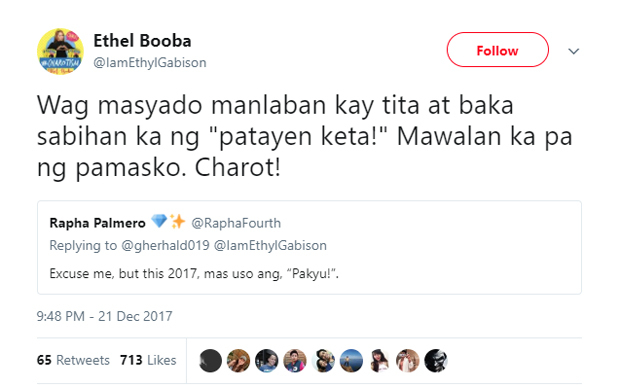 Kung hindi ko kayang— ako na mismo, 'P**, patayin mo 'yan.'" 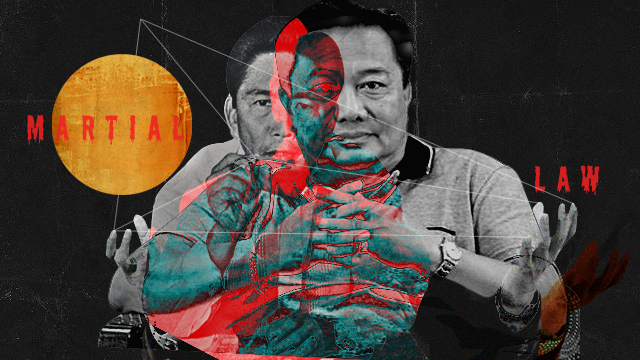 In another speech in August 2016 at Camp Guillermo Nakar in Quezon Province, he recalled his term as mayor of Davao City and said: "Kayong mga hold-upper, kidnapper at lahat ng criminals, at ang mga durugista, umalis kayo ng Davao. Kasi 'pag hindi, papatayin ko kayo." So far, there has been no response from Sass Sasot.